The NYTimes magazine describes efforts to resurrect extinct species such as mammoths. Let's suppose this is possible. Perhaps it will even be possible with Neanderthals, Denisovans, Homo Erectus and other pre-modern human types. Consider the following thought experiment. Imagine thousands of Neanderthals on some privately held land in Siberia, perhaps the secret project of a reclusive billionaire oligarch. It's very likely these Neanderthals, although able to interbreed with humans, and probably capable of speech, will be on average considerably less intelligent than humans. If I had to guess I would suppose their average adult IQ to be about 70, or -2 SD relative to modern humans. You might wonder how they could have survived for 300k+ years with such modest intelligence, but based on my experiences with 5-10 year old kids I don't think that a sub-adult level of maximum intelligence precludes the ability to form societies and function as hunter-gatherers. (Apes survive with even less cognitive ability.) I just don't think that higher developments (e.g., invention of writing) are likely for such a population. What Homo Sapiens accomplished in 50-100k years far outstrips Neanderthal accomplishments over a much longer period of time. Now to the problem: how should we integrate these Neanderthals into modern society? Perhaps we should not integrate them -- better to leave them alone on protected lands, to live their ''natural'' (= nasty, brutish and short?) lives. But what if some Neanderthals express the wish to join our society? How should we best help them? I think it's likely that no amount of special education or training will allow average Neanderthals to be successful in cognitively demanding jobs. They might face significant discrimination, given their appearance. However, let us suppose that in this future the technology exists to modify the genes which cause the cognitive gap between moderns and Neanderthals. Suppose it is possible, through genetic engineering, to modify the genomes of Neanderthal embryos, causing their brains to develop as ours do. Would it not be our moral duty to make this modification available to Neanderthal parents who want it? 1) Is it "racist" to make the assumptions used in our hypothetical? 2) Is it also our moral duty to make similar modifications available to human parents who happen to be well below average in cognitive ability? Their genetic IQ's would have been a lot higher than 70 to have survived in such cold climates. The two factors that have driven modern Northern Eurasian IQ so high (100+) has been the cognitive challenge of adapting to cold climates (which drove brain size way up) and the post-agriculture population explosion (which increased the odds of rare neurological efficiency mutations which increased IQ by about 1 SD independent of brain size). If I had to guess I would say Neanderthals had IQ resembling modern arctic people (i.e. 91), another pre-agriculture big brained cold adapted population. On a tangent, can we make any inferences about the intelligence of other cold climate animals? How exactly are polar bears different from brown bears? Anyway they have a proper place in the zoo. While it's true that children have less experience than adults, they are also less intelligent. They have smaller less developed brains and even on novel problems that don't require experience, they perform much worse than adults at their prime. About 70,000 years ago, humans had the intelligence of a modern Canadian seven year old. Upon experiencing the extreme ice age, northern Eurasian intellect increased to the level of a Canadian 13 year old. With such high intelligence, agriculture emerged in even inhospitable lands and population size exploded producing mutations that increased Northern intelligence to that of a Canadian 16 year old. However agriculture also brought severe malnutrition which shrunk intelligence back down to 12 year old levels. Only in the last century or so has nutrition improved enough for us to recover all the brain size and development we lost from agriculture, causing intelligence to boost to 16 year old levels (see the Flynn Effect). My guess is no. I think it's not just learning and experience that make an 8 year old different from an adult. The brain grows and matures in a number of ways in the intervening years. My wild guess is that Neanderthal adults might have cognitive abilities similar to an 8 year old modern, and that that is not inconsistent with their ability to survive in cold environments. When you adjust for body size, humans have the biggest brains on earth. all hail the tree shrew. http://en.wikipedia.org/wiki/Brain-to-body_mass_ratio much noise, little signal. maybe you need to change your username? could we not allow people to fix them prior to or after birth? The tree shrew may have the largest brain size/body size ratio, but humans have the largest encephalization quotient (EQ). The latter is the correct way to adjust for body size. What do you suppose the IQ was of the modern humans who lived at the time of the Neanderthals? I should clarify that the -2 SD I use in the post is for Neanderthals living in modern society -- so, benefiting from good nutrition, education, etc. 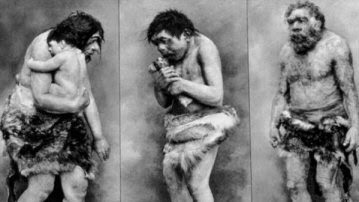 Neanderthals and early humans living under difficult conditions probably both have depressed abilities. But my guess is that there was a significant gap between the two groups, at least 1 SD or more. human parents who happen to be well below average in cognitive ability?" This is nothing compared to the moral duty to help Africans decrease MAOA-2R prevalence. The direct effect of MAOA-2R on violent behavior is well supported on a theoretical basis due to established findings for Brunner syndrome, 5-HIAA metabolites, various MAOA-3R G-E interactions, and in vitro and small-sample MAOA-2R studies. MAOA-2R is about 22 times more common in African-American men than white men. The fact that scientists seem so reluctant to specifically study MAOA-2R, let alone help reduce its prevalence, should seriously be considered racial genocide. Some sources would be nice for your "matter of fact" assertations as ahd also mentioned. I don't think you can extrapolate the difference between cold climate humans to other animal kingdom. The brain is a very costly organ, consuming enormous energy for its size. Animals in the arctic may rely on other features(like being able to hibernate longer) to survive the cold. My guess is that the European modern humans who lived contemporaneously with Neanderthals had IQ's of 87, about 13 points below Europeans today. I base this on the fact that the hunter/gatherers score almost 1 SD below agriculturalists of the same type. Thus East Asians score 14 points higher than their hunter/gather cousins in the arctic (the Inuit), and mainstream sub-Saharan African score about 13 points above bushmen/pygmies, so today's Europeans should score about 13 points higher than their hunter/gatherer ancestors. I think this difference is genetic, not environmental, because Cro-Magnon man was actually taller and bigger brained than early 20th century Europeans, suggesting better nutrition. I think the malnutrition of agriculture stunted brain growth, but we compensated as the huge population allowed new mutations to enhance our IQ's independently of brain size. Now with advances in modern nutrition, we not only have those genetic enhancements but are recovering our pre-agriculture brain size, hence the Flynn Effect. I'm not sure modern 8 year old intelligence is anywhere near enough to survive cold climates. To put it in perspective, Homo Erectus is thought to have the mental ability of a modern 7 year old based on a study that found that 7 year olds could be taught to make their tools. The study is a few decades old, so maybe it should be revised to a 6 year old (Flynn Effect). Jensen claims no Homo erects remains have been found in Northern Asia, probably because the climate was beyond their survival skills. If I had to guess I would suppose their average adult IQ to be about 70, or -2 SD relative to modern humans. Suppose it is possible, through genetic engineering, to modify the genomes of Neanderthal embryos, causing their brains to develop as ours do. Would it not be our moral duty to make this modification available to Neanderthal parents who want it? One method of answering this question is by asking the following. Is it the moral obligation of Neanderthal parents to not choose Neanderthal partners over Homosapiens knowing that they will create people that will have a lower genetic mean IQ (ie. comparatively underdeveloped brain)? Personally, no I do not believe it's our moral duty any more so, than it is for them to choose Homosapiens to produce offspring with. Then yes, it's racist, especially if you agree with Darwin who would also be categorized as a racist. Then not necessarily, and I would hope not. I take it that you are trying to build an ethical case that humanity has a moral obligation to fund research into improving our genetics? Humans can already decide to choose partners who have significantly higher cognitive ability as partners to create offspring with (eg. physicists) that won't be well below average. For it to be our moral obligation, then isn't it our moral obligation to search genetically superior partners, and also shouldn't we remove ourselves from reproduction pool if we have inferior genes? Trying to build a case that there's a moral obligation to make available this service, leads to all sorts of conclusions that I feel one could adamantly argue is far more immoral, usurping the moral high ground against the initial case. Interesting hypothetical. I'm not entirely sure I'm right, but those are my current thoughts. See the wikipedia article on encephalization quotient which lists humans as having the biggest in a large chart you can't miss. I was more interested in the historic IQ levels and IQ increase due to ice age. I wonder if you could estimate Neanderthal IQ by testing modern Europeans of varying degrees of Neanderthal admixtures. Let's say that the average European has 2% Neanderthal admixture and an IQ of 100. But let's assume Europeans with 4% Neanderthal admixture have IQ's of 99.5. From there could one mathematically extrapolate what IQ people with 100% Neanderthal admixture would have. A good source for all that is Richard Lynn's 2006 book which includes a chapter about how and why humans became smarter the further North they migrated. The crew at West Hunter were thinking on this, and yes your a racist. We can't even get our HS house in order. It seems we ought to start there before we tell the nice Neanderthal next door he is due for a tune up. ok, i took the bait. i read the wikipedia article. it ends with a criticism: "Recent research indicates that whole brain size is a better measure of cognitive abilities than EQ for primates at least." the whole thing is dumb: if the premise of EQ is that X grams of brain mass or Y neurons are required for certain body functions and don't scale with size then you'd regress with an intercept not fit some cockamamie polynomial. silliness. "Would it not be our moral duty to make this modification available to Neanderthal parents who want it? i do trust my instinct however unfounded that people who look stupid are stupid. people who look like apes are stupid. but there are plenty of 100% europeans and 100% chinese that look dumber and are dumber than this guy http://www.aliefpost.com/wp-content/uploads/2013/10/mo-ibrahim.jpg. and, of course, at the far left of the bell curve reproduction is negligible. those with iqs in the bottom 2% for their population have far fewer children than those in the top 2%. and what about this guy http://diepresse.com/images/uploads/4/7/5/365685/thumbDi_Toefting2.jpg, a famous danish footballer? but would neanderthal officers score higher than non-neanderthal enlisteds? that is supposing a neanderthal would have any score on an iq test at all. my dog can't even answer a single sat question correctly. so dumb. but the he can smell through 10 ft of lead. hasn't gs always preferred ascidians to the encephalized? blankfein is quite short and now bearded for reasons unknowable. is he human or neanderthal? Then yes, it's racist, especially if you agree with Darwin who would also be categorized as a racist." With this definition it would be better to call it "being right". This is true within different populations within different (poorly defined) races. I highly doubt that's possible. Most of the neanderthal genome is gone. And since the disadvantageous stuff are selected against probably low iq genes would be gone too. Unfortunately, "being right" and being "racist" aren't mutually exclusive by this definition. Stephen wrote "racist" in quotes, so I wasn't sure if he meant it by definition #1 or in a more casual way often associated with #2. Either way, I think we'd have to categorize those assumptions, along with Darwin, as racist or "racist". I'm not sure why comment disappeared. I'm guessing it's some technical error, but I hope I didn't break some rule I'm unfamiliar with. I don't think so, but I apologize if that's the case Steve. I'll restate that "being right" and being "racist" in making those assumptions aren't mutually exclusive. I'm very much willing to hear how it's not racist, and would personally root for myself to be wrong on that matter. For younger kids the tests themselves are different. Scores are normalized by age group and mean scores improve with age until early adulthood. In some studies of gifted kids they have them take the SAT early and normalize by age cohort. IIRC, a score that is 99.99th percentile for a 13 year old is much lower than the 99th percentile score of a 17 year old. thanks. sat result doesn't surprise me because sat success clearly depends on ability + knowledge + practice, not just ability. but pattern recognition, next shape in sequence, etc. really do seem like knowledge-independent tests of some basic kinds of intelligence. surprising to me that there'd an age-dependence to such test scores. do i need to trash my preconception, or might a reasonable person think the iq tests also depend on knowledge or practice, as well as raw ability? This type of test does not (at least superficially) rely on knowledge acquisition. On page 6 (Table 1) you can see age-dependent norms. Of course in reality there is no perfect way to disentangle "ability developed through training/schooling" and "ability developed due to brain maturation". 1) If you look at how existing disparities are viewed, then those assumptions about neanderthals would probably be described as r8cist. 2) If that technology existed I suppose governments would see it as necessary to offer it to everyone to create a level playing field & provide equal opportunity. 3) It would be interesting to see how long those who attribute disparities to privilege/oppression would be prepared to advocate genetic treatments to alleviate social inequality. Actually it's arguably quite easy to disentangle ability developed through training/schooling from ability developed through brain maturation. Think of the difference between scholastic tests like the SAT and culture reduced tests like Matrix reasoning, Block Design and Digit Span. The whole dichotomy of fluid and crystalized ability depends on the assumption that we can disentangle them. what if neandertals were smarter than sapiens? of course "smartness doesn't exist - b/c that'd be "racist." sadly for egalitarians, "g" exists, so i prefer the term "empiricist." do the scatter plot: a very modest positive correlation between neandertal DNA & "g" (or "IQ"). it's a no-brainer. :) Did that some time ago. Although so far the MCPH1 haplotype D has not been found from the limited neanderthal DNA data, the idea is interesting. the numerical ranking and the geographical distribution for the respective populations roughly correlate with that for the OECD PISA data. This does not constitute proof because of there is no concrete casuality, small data size and many assumptions used. Substitting Shanghai for CHB, HK for CHS, Costa Rica for PUR, did not use US data for CEU and no relevant data for the African population (although the data should agree with the general trend). The prob (F) value of 0.0157 is quite significant. those who keep talking as if fluid and crystallized intelligence referred to things obviously can't tell the difference between intension and extension. that question is totally meaningless unless what one means by it is: if these earlier humans were delivered as infants by a time traveling stork to an upper middle class family in minneapolis what would their scores be? who was pope before peter? have you stopped beating your wife? neanderthals didn't have an iq. it's a category mistake. That scientific America article you linked to is really stupid. Crystallized tests have high heritability because they're more reliable than on the spot problem solving, not because there's no difference between fluid & crystallized ability. We know from studies of aging that old people continue to perform well on crystalized tests of knowledge (vocabulary) even after their actual intelligence (as measured by fluid tests) is quite impaired. My research shows that 90% of the commenters have missed the point. This is brilliant. excellent job - i love you! seriously, good work. you didn't read the article. the study is by a dutchman. it's been the case forever that vocab is the most g-loaded. more bs. "even after their actual intelligence". what tests have been flynned the most? not vocab or arithmetic? on what tests did afrikaners score lower than british south africans in the 50s but son't any more? surely it was the culturally loaded ones? nope. it was the "fluid" ones. calling FACTS pc and assuming that if there is a word and a sense then there is a thing to which it refers make me think your own g is not that high. gee look, they “measured” cultural loadings:) niiiice. they hid certain things like black/white means are equal on digits forward (b/c that’s low g) & black/white means are disparate on digits backward - b/c that's high g (nothing to do with culture or how verbal, etc.) wonder why they hid that – oh wait – agenda – a willing media! the truth is & always has been: high g-loading tests have high heritability coefficients. low g loading tests have lower heritability coefficients. But, knowing that in advance, means you can leave out what you want, use old tests that are highly cultural, make up your own cultural variable & get it to say what you want. & get the media excited – as they aren’t for the hundreds of studies that don’t support these one-off findings!! rocks are – culture or g - too bad we’re trying to predict success in the culture – you knew that – you pointed out the dumbness of time machine stork babies – we’re all stuck in a rapidly homogenizing culture & it does us no good to use tests that predict success in a 50,000 year old culture – you knew that already! gahh! you got me to read a stupid article! yahghhH! The reason tests like vocab and arithmetic show limited Flynn Effect is because the Flynn Effect reflects an actual rise in brain size & neurological development that has occurred over the 20th century, and thus it shows up best on direct fluid measures of actual intelligence (i.e. Raven, Similarities) not crystallized measures of knowledge (vocab, arithmetic, SATs). Now in homogenous cultures, crystallized knowledge tests (because they're so reliable and stable) may correlate better with intelligence than actual intelligence tests, but they are an INDIRECT measure. Not sure why this is so hard for you to grasp. gee. you have no idea what you're talking about, so i stopped reading. "matrix reasoning" is a new addition. how many studies in how many countries on its reliability and g-loading? the ravens is the least correlated with other self-described iq tests, that is, of all self-described iq tests. it is not a battery, but only one sort of test. it is the most flynned. yet klansmen claim it's the most g-loaded. whatever. leave the intelligence research to those with higher iqs than you. Chartreuse, the distinction between crystallized and fluid ability is very much valid and all your attempts to debunk it here have been very easily countered. a pair of typical hereditist iq mongers. if by "and all your attempts to debunk it here have been very easily countered" you mean "not even understood or addressed let alone countered" i agree. maybe you should practice on the n-back a little more. there ARE differences between the tests categorized as fluid and those categorized as crystallized. there are difference in the parts of the brain used. BUT that difference is NOT fluid or crystallized. ALL of the putative fluid tests are IN FACT testing aquired abilities. there is a real difference between visua-spatial and verbal intelligence however. Chartreuse, anything you could say, I've thought of it twice. (by which i assume you mean have never thought of) The herritabilities (sic. )(corrected for reliability) do not even include the two most g loaded Wechsler fluid tests (figure weights, matrix reasoning) (these are brand new. how many studies have been done? how can the ravens be the LEAST correlated with other self-described iq tests?). All you've shown is that verbal ability is more herritabie (sic.) than spatial ability and/or that g loaded tests are more heritable than less g loaded tests. How does that falsify the crystallized fluid dichotomy? (the dichotomy is unfalsifiable then)( Note, fluid tests can be verbal and crystallized tests can be spatial. (can be theoretically but never are IN FACT.) If anything fluid tests should be less heritable because they reflect how much intelligence one currently has while crystallized tessts reflect how much intelligence one used to have before environmental insults to the brain accumulated (i.e. alcohol, drugs, head injuries, medication, etc). In addition, it's well documented that verbal and scholastic abilities are much more resistant to prenatal malnutrition (and 1962 dutch recruits' ravens were totally immune to the effects of famine when they were in the womb or infants)which stunts brain size and intelligence. "fluid" intelligence DOES NOT EXIST. every test will measure experience and what one has made from it, or the extent to which one can make anything of it at all. the well-nourished child who is raised by wolves will not have the same "fluid intelligence" as his counterpart who is raised bu upmc parents in a developed country. I agree that no test is 100% fluid, but many are close enough to make it a useful meaningful concept. A child raised by wolves might at first flunk a fluid test, but after a few weeks of domestication, fluid tests would reflect his biological potential. By contrast he may never reach his potential on the SAT. I agree that among culturally homogenous people, crystallized tests are often a better measure of intelligence, but there are many situations where only fluid tests are appropriate. IS the DUMBEST thing i've EVER heard. there is a part of violinists brains which is enlarged as a result of their violin-ing. environment, not just food, can be nutritious or not. whatever the test save perhaps reaction time, ects, etc. (but likely not even those) will test the extent to which the brain has developed to play the metaphorical violin. and this is crystallized ability, even if it can't be put into words. "not that any child could be raised by wolves". A child could be raised by dogs so maybe a child could be raised by wolves. but if not age 22 is quite a long time from her first six years. i wonder how she'd do on the matrix reasoning? you are polite and not abrasive, but you're actually arguing against yourself. and i'm sure that the correlation between fischer random rating and standard rating is near 1. Well a fluid test by definition is something you've virtually never done before. Fluid intelligence is defined as NOVEL problem solving. Once you've practiced it, it's no longer a valid measure of your intelligence. Fluid intelligence can also be defined as the ability to learn, while crystallized intelligence is how much you have learned. Obviously they're highly correlated since how much you've learned is largely a function of your ability to learn. But fluid tests attempt to directly measure your ability to learn by giving you a novel problem to figure out on the spot while crystallized tests just infer your ability to learn indirectly by measuring your acquitted knowledge. Fluid tests are clearly more accurate for culturally heterogeneous comparisons, but among the culturally homogenous, the indirect approach might work better since acquired knowledge over a lifetime averages out all the day to day fluctuations in fluid performance caused by sleep deprivation, alcohol, drugs, head injuries, motivation, etc. One issue is people can get brain damage or dimentia and lose their ability to learn new things while still retaining what they've already learned in their pre-morbid state. In these cases, crystallized tests are like fossils crystallized in rocks, preserving the intelligence that once existed, long after it's gone. "the ability to learn" is another mere abstraction. one can speak concepts into existence. he cannot speak things into existence. and things needn't conform to concepts. and putative "fluid" tests do NOT measure learning ability even if there were such a thing. as one professor of mine said, "for most students school is just pattern recognition. they 'learn' what they have to to pass and then they forget it." it's been my experience that there are humans who correspond to airdales. that is, they do not learn quickly, but they do learn forever. they do not learn to shuck and jive like a pigeon in a skinner box. they understand. iq and speed of learning are very decidedly NOT the same thing. metaphorically, human airdales will have higher iqs than the pattern recognizers. Comes up in teaching kids chess. Whilst some young kids really "get chess" at a very young age, the majority struggle with basics till they are around 9. Thus being bright, but not an especially good chess player I'm about the level of the best 13 year olds in my country. Sure there is a lot of learning in chess, but the best 16 year olds are way ahead of me, and it ain't three years extra learning, heck one guy was beating me at 18 who learnt at 16. I think as parents we have a duty to do the best for our offspring, part of that is selecting partner. Genetic fixes, and similar, fit in the same way. I vaccinate to avoid disease in my child for the same reasons. My concern is not the need to do this, but when is it safe/effective. We already see that with the cervical cancer vaccine, which is fantastic science, and safety is excellent, evidence of effectiveness from antibody response excellent, but the evidence for benefit is just (literally Dec 2013), and that benefit is a reduction in HPV 16 and 18 in women under 24. It was introduced 5 years ago. I'm sure in time we'll see a 65% or more drop in cervical cancer, but there are assumptions built into that claim which could be wrong, because disease epidemiology is complex. It could be the vaccine prevents harmless forms of HPV spreading which would have induced natural immunity. The risk of such is exceedingly low, otherwise we wouldn't be offering a universal (in girls) vaccine. Ultimately till the first generation die, hopefully at more than average life expectancy, we won't be able to be completely confident. This case is a no-brainer, but not all interventions bringing short term advantage are as clear cut. I can imagine my son being presented with 10 or 20 genetic treatments for his offspring, all in varying stages of evidence, none of which will have had long term testing. As with vaccine there will be nay sayers for whom no evidence is not sufficient, but part of our confidence with vaccines is we have a couple of centuries of experience. I find this entire column and comment thread insensitive and offensive. I myself am a caveman, a neanderthal, if you will. I was discovered in glacier, frozen, some years and thawed out and brought back to life. My IQ is not so low that I could not make it in this frightening and confusing modern world. In fact, I even made it through college and law school. I think people need to not be so afraid of scientific advancement. If we can better ourselves through science, we should. Certainly not force it on anyone, although I can't imagine anyone not wanting the best for their children. If you could make you children smarter, healthy, stronger, kinder,happier, better why wouldn't you? I think anything negative that impacts a person and society, if we have the capability to over come it through science, we should offer it! It reminds me of the recent movie, transcendence. This guy uploads his mind into a super computer and then he is able to come up with all of these wonderful ways to heal the earth and better people physically. However, because people were too afraid of the advancements, as they came much more quickly than people could understand what was behind it, they were too scared to see what the computer was trying to do and offer. People have always been afraid of advancement and technology and science. It's sad really. I don't think we should bring back long extinct things like mammoths and neanderthals. I think they belong in the past. However, if we can use that same technology to save recently extinct animals who died because of our behavior or save animals who are endangered for the same reason, then absolutely I think we should. I think to bring a neanderthal into this world as it is now would be cruel. They aren't quite human but not quite 'animalistic'. Yet they require the same basic necessities as us and we are over populated as it is, can't take care of our own species as it is. If we brought them back, we'd be responsible for them. We'd need to find land for them, house them, clothe them, feed them, educate them. For what? So they can be outcasts and barely understand what the hell is going on? They'd be miserable and they'd just be a drain on our society. And if we're going to advance their brains to be like ours... then what's the point? We'd have human brains inside neanderthals bodies. Extra cruel! I'd be okay with maybe a family of them in a special institutional environment for study purposes, as long as they were well taken care of, as long as they were sterilized and couldn't breed. To see what their behaviors and habits were I think would be fascinating. However, not to where there's a whole bunch of the wondering around and breeding and interbreeding and needing all kinds of things and taking up a bunch of resources and having to try to fit in but of course can't. No matter what, they'd never be human. We could be as kind as possible to them and except them with love and openness, but they'd never be human... yet they'd have to live in our world. Caught somewhere in between human and lower animals. >.< Horrifying.... and they'd never understand why. what if their characters were way more advanced, could we come up with a genetic modification for that? Where did you come up with the idea that Neanderthals were stupid? They created tools, buried their dead, and did a lot of things that homo sapiens were doing at the time. Are they stupid because they went extinct? Well in that case, if nuclear bombs started to go off like some apocalyptic movie scenario or an asteroid hit Earth, cockroaches would survive and humans would die. Would that make cockroaches smarter than humans? organisms: mammoths, Neanderthals and even ancient Homo Sapienses. carrying genes that provide HIV resistance.